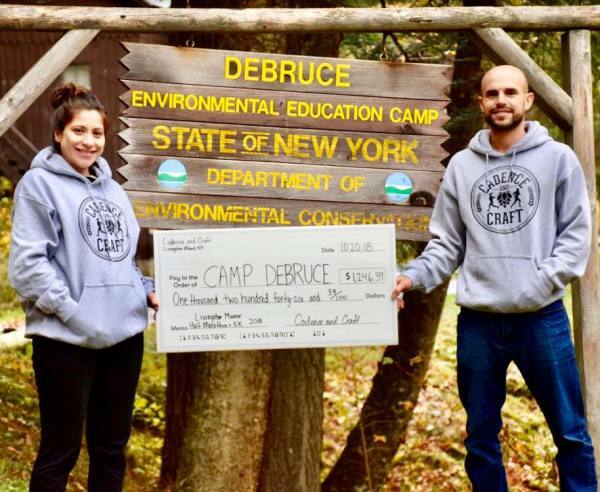 Camp DeBruce is situated on over 300 acres adjacent to the Catskill Forest Preserve. Formerly a private estate and fish hatchery, DEC acquired Camp DeBruce in the 1940s and converted it into a conservation education camp. DeBruce was the second DEC Summer camp open, and is the longest-running of the four camps in operation today. It is within walking distance of natural forests, trout streams, the Catskill Fish Hatchery and Mongaup Pond State Public Campsite. It sits among some high quality trout streams and fly fishing remains a popular activity at the camp today. A week at DeBruce promises fun and adventure in the beautiful Catskills. Sometimes campers are able to pick the activities they want to participate in from a handful being offered, while at other times everyone participates in the same game or activity. Lesson groups at camp cover a range of topics led by camp counselors with backgrounds in science, education, or recreation. Lessons might include examining insects and flowers in a nearby field or meadow, using nets to study macroinvertebrates and aquatic systems, or venturing into the forest to learn about diversity and forestry. Throughout the week campers engage in activities that emphasize basic ecological concepts about habitats, species identification, and how organisms and habitats adapt to changes. They also consider environmental solutions through activities and scenarios that encourage campers to make decisions that mitigate their impacts on the environment around them. Camp DeBruce is a short walk from the Catskill Fish Hatchery, and most weeks include a visit to the hatchery. While DeBruce doesn't have on-site swimming the camp makes trips to the nearby Mongaup Pond for swimming activities. Campers also have opportunities to try new skills, including archery, canoeing, fishing, birding, or taking a Sportsman Education class. Sportsman Education classes are limited and offer campers a chance to complete their safety certificates on the path to a hunting or trapping license. Visit the Sportsman Education at Campspage to learn more. Camp DeBruce also offers fly-tying and fly fishing lessons with the support of the local DeBruce flyfishing club, a program with a long standing history at Camp Debruce and its many trout strams. Day trips at Debruce include hiking Catskill trails, canoeing or swimming at Mongaup Pond, or visits to nearby sites like the Catskill Mountain Fly Fishing Center and Museum as the week allows. Each week campers also go on one overnight trip and learn camping skills. Overnight trips at DeBruce frequently use camp sites within the Catskills in the nearby Big Indian Wilderness and Willowemoc Wild Forest areas. Of course, camp also includes skits by counselors and campers, songs, campfires, and recreation games to round out the week. Many of the activities at camp are from environmental education programs like Project Wild or Project Learning Tree, which allows campers to play games while further reinforcing ecological concepts. College-educated counselor staff guide all the activities, encouraging participation and respect among group members while interpreting the natural world for campers.